Coins of America, online at CoinsofAmerica.com, is your destination for US coins, coin sets, and information about the history of coins in this country. Coins of America sells a variety of coins and commemorative coin sets including those in honor of the First Lady, the military, special holidays, and in tribute to September 11. There are also dollar coin collections, including Presidential Coin Collections as well as Native American and Susan B. Anthony collections sold on Coins of America. Coins of America also carries paper money, stamp sets, display boxes, coin cases, and jewelry including: money clips, necklaces, cuff links, and key chains. RetailSteal.com has the best Coins of America coupon codes, Coins of America discounts, Coins of America coupons, and Coins of America promo codes. Shipping and handling rates at Coins of America depend on the pricing of your purchase and your shipping destination. Coins of America adds a shipping charge of $6.95 to orders when they ship. Orders are shipped via USPS or UPS Ground. See website for full details, exclusions may apply. Click this link to shop at Coins of America today and enter our coupon code at checkout online to save 5% on merchandise. Use this code at Coins of America and receive a free Royal Wedding Coin at checkout. 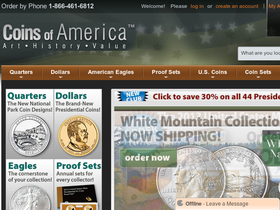 Use this Code at Coins of America to save $5 on every Eagle purchased. Enjoy 5% off Abraham Lincoln coins from Coins of America with this coupon code! Click link to shop now. Save 50-90% during the Liquidation Sale at CoinsofAmerica.com. Click to save. Save up to 60% on coin collections when shopping online at CoinsofAmerica.com. Click to save. Get the State Quarter map for only $14.45 at CoinsofAmerica.com. Click to save. Get 2012 Quarter Proof Sets for only $19.95 at CoinsOfAmerica.com. Click link to save now. Refer a friend and get a free gift at Coins of America. Click link to save. Click link and take advantage of 35% off the National Parks Quarter Club Membership at CoinsofAmerica.com. Get the entire collection at a discount when you sign up now!